Valentine’s Day is coming up – and I just can’t help but think about all the star-crossed lovers who grace the pages of Hawaiian history and legend. Around Hawaii, nearly all our natural wonders and beautiful flowers have a legend attached to them, and many of these legends are about lovers who are embroiled in scandal. Here, I’ve put together a short-list of my favorite lovers and romantic legends in Hawaii — just in time for Valentine’s Day! The naupaka flower looks like a flower that's been torn in half. It's uniquely tied to an ancient Hawaiian legend. 2. 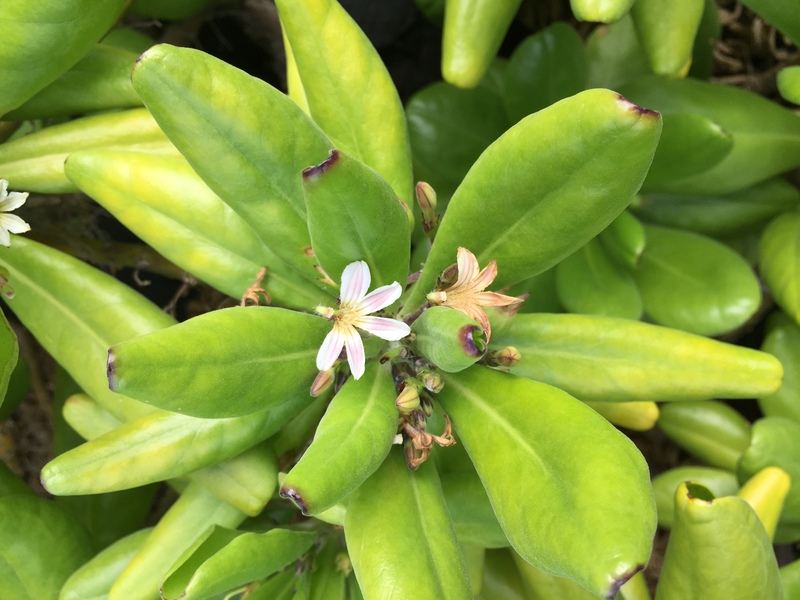 Why you should put two naupaka flowers together: When my family and I lived in Waikoloa on the Big Island, naupaka was everywhere — and, as I strolled my baby daughter, I would often tell her about the legend behind this unusually-shaped flower (the flowers appear to have been torn in half). According to Hawaiian legend, Naupaka was a beautiful princess who fell in love with a commoner named Kaui. The star-crossed lovers could never marry and so Naupaka vowed to stay in the mountains while Kaui remained along the ocean. Before parting for the very last time, however, Naupaka took the flower from her hair and tore it in half, giving it to Kaui. Even the nearby plants were saddened by the scene, and the very next day they began to bloom only half flowers in honor of the separated lovers. 3. The legend of Sweetheart Rock: Like my experience with the naupaka flower, anytime I gaze upon Sweetheart Rock on Lanai, I can’t help but let my mind wander to the romantic legend behind the natural wonder. The logical part of me understands that ancient people will often make-up stories about unexplained fascinations of nature. But, the romantic side of me wants to believe in the legend. 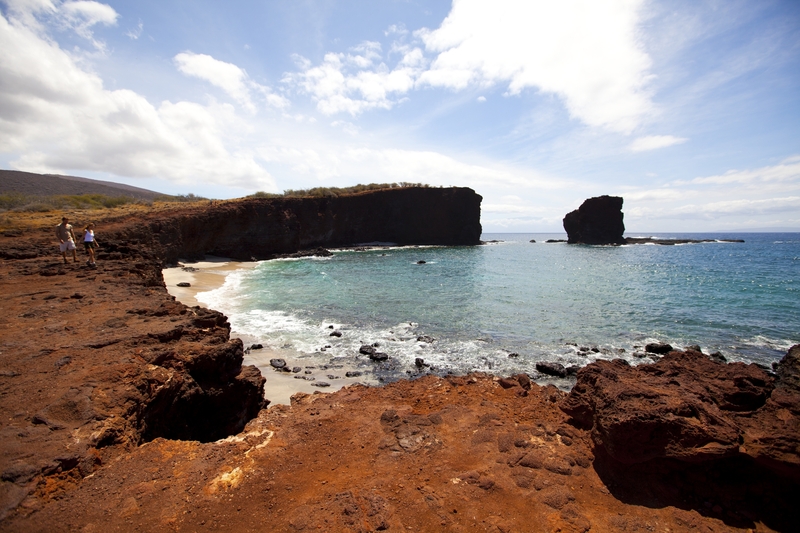 You can make up your own mind, but here’s the legend behind Sweetheart Rock: According to MauiTime, Pehe, the maiden from Lanai, fell in love with Makakehau, the warrior from Lanai. In fact, Makakehau translates as “misty eyes,” expressing just how smitten he was with Pehe. Anyway, Makakehau–though romantic and dashing–was also a tad bit jealous. So much so that he imprisoned Pehe in a cave right on the peninsula shore between Manele Bay and Hulopoe. Then one day, a fierce storm rose while he was away, drowning Pehe before he could return and rescue her. Stricken with grief, Makakehau is said to have carried Pehe’s body to the top of the sea stack that towers over the peninsula, entombed her within it and then leaped to his death. Stricken with grief, Makakehau is said to have carried Pehe’s body to the top of the sea stack that towers over the peninsula, entombed her within it and then leaped to his death. Next time you book a Maui Hiking Tour, a Kauai Guided Hiking Tour, or a Haleakala Crater Hike, make sure you ask your guide about the stories BEHIND the natural wonders. You never know what romantic legends in Hawaii lurk underneath our beautiful scenery!